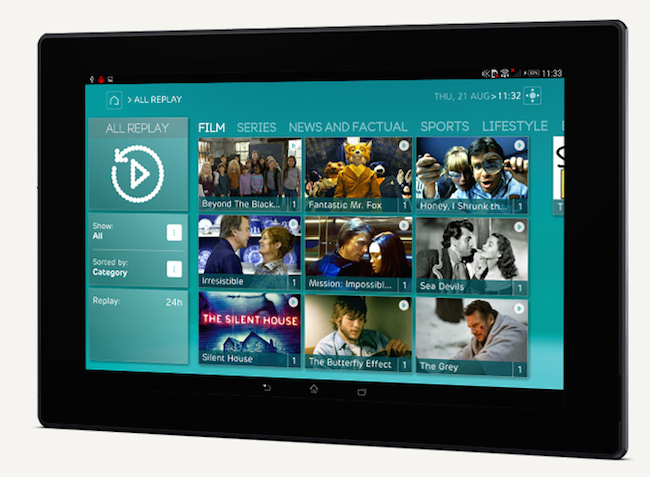 Updated EE is launching a multi-device TV catchup rival to BT, TalkTalk and BSkyB. But it's snubbing both YouView, a BBC-originated TV platform designed for UK catchup-over-broadband operators, and Freeview Connect, the would-be YouView killer. The new service will be free to EE fixed broadband customers – but will cost £9.99 for mobile customers. EE won't spend money on commissioning or buying in content for EE TV, but intends relying on catchup material from free-to-air PSBs (Public Service Broadcasters), and apps from OTT players (such as Netflix and Sky's Now TV) providing the rest. The latter is a notable omission: Wuaki is the only recognisable OTT brand at launch. ITV Player and 4OD are also absent. The service will be bundled free with EE's DSL broadband offering, with a set top box based on French manufacturer Netgem, but cost mobile punters. "We pay large amounts of money to watch TV in another room and even more to watch recorded TV", EE's marketing chief Pippa Dunn told the launch gathering. So EE has designed its own EPG which has a nod to Android smartphone UIs. EE TV will play across multiple devices per household, with up to four supported. You can pause and resume watching on another device, and an app app for iOS and Android will change channels and program the PVR without interrupting the main living room stream. 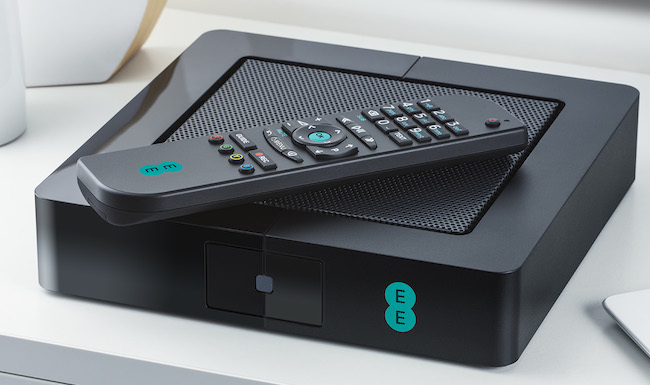 EE said the box was "twice as powerful" as anything on the market, with 4HD tuners allowing four simultaneous channel downloads, full HBB-TV, a 1TB hard drive and dual band Wi-Fi. Why not go with YouView or wait for FreeView Connect, we asked EE? "We didn't want to be constrained by TV thinking, we are mobile people" Dunn told us. However it transpires that the multiscreen feature is Wi-Fi only at the moment – limiting you to your home network. Er… not very mobile. "FreeView Connect have not published a specification, so it's difficult to comment. But from what we can read, it will be based on HBB-TV and this is based on HTML5 so I think we're heading in the right direction." Most modern TVs have a far richer choice of OTT services, but they don't have the multiscreen capability. Is firing up the Netflix app on the iPad in the next room really so hard? We'll have to see. It may well put a squeeze on the £4-£8 month premium TalkTalk charges. 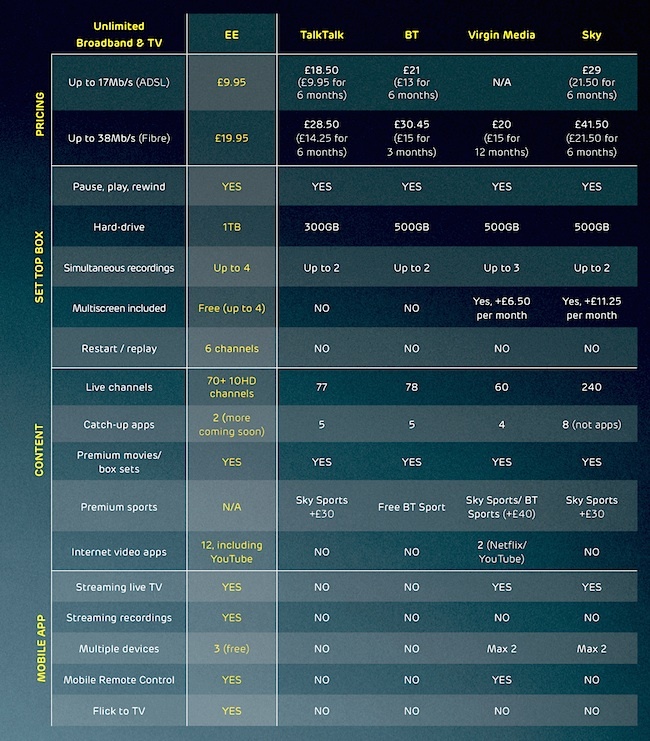 * TalkTalk has been in touch to say that several of the details on the EE-supplied table are not accurate. 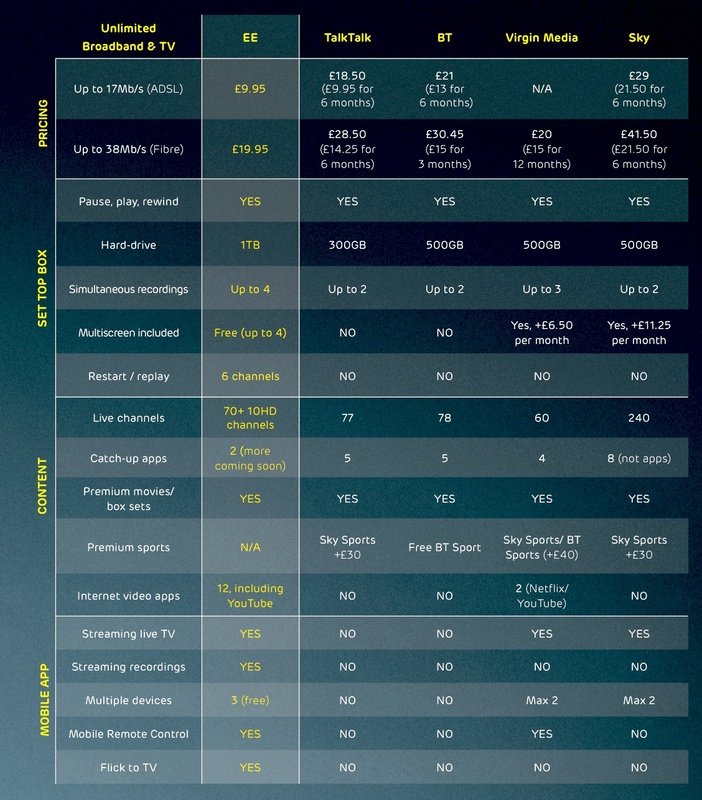 It says that Plus TV on standard broadband is £18.50 discounted to £9.50 for six months (not £9.95); that TalkTalk TV has more than 170 live channels available, not 77; that it now has eight catch-up apps/players, not five; and that its set top box packs 320GB, not 300GB.